This addition to Teamie will prove to be a blessing for administrators who wish to see site-wide analytics aggregated by classrooms and users quickly and without any fuss. This will complement the already present admin dashboard which has been helping administrators for a couple of years now. Once you open your sidebar, you will see an option to navigate to the reports page by clicking “User and Group Statistics”. You will land on the Classroom statistics page. This page has an extensive set of filters based on important identifiers, such as, meta fields, status etc. The From/To filter will be the key filter to these reports as the report for both the users and classrooms will be generated for the selected time period. By default the last month will be selected for the report. 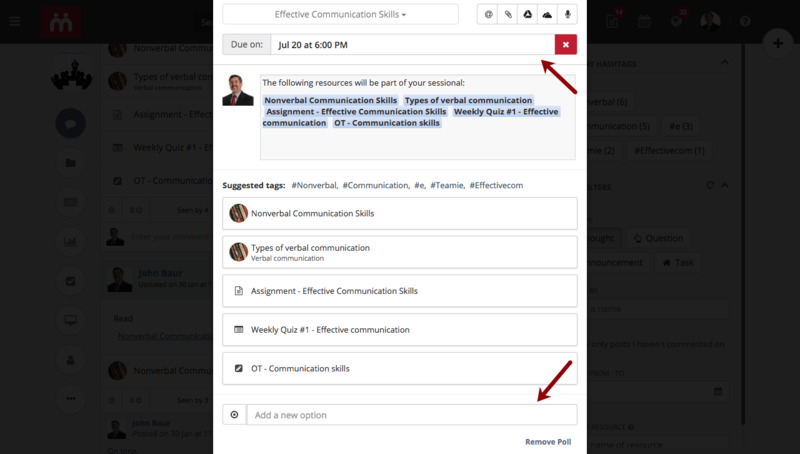 You can apply different filters to narrow down on the required classroom(s). By default, the data till the last date of the previous month will be shown. Once the search results are populated, you can see all the statistics in the form of scrollable columns. The report is exhaustive and you will find all the statistics you need for a classroom / social group. Similarly for the Users tab, you can filter by name, email and status (Active / Blocked) for a particular time period and see their statistics for the same. In addition to viewing the report, you can export it by using the export button placed right below the filters. The web view will show the maximum of 100 rows in a page; the export will contain all classrooms matching the selected filters with data for the given time period. The exported report will be sent to your registered email id shortly. One time or another, most of you would have wanted to change one post type to another. Say, a thought post that you shared might have been better as a question post or a question post you created might have been more effective with a deadline. Wouldn’t that be nice? 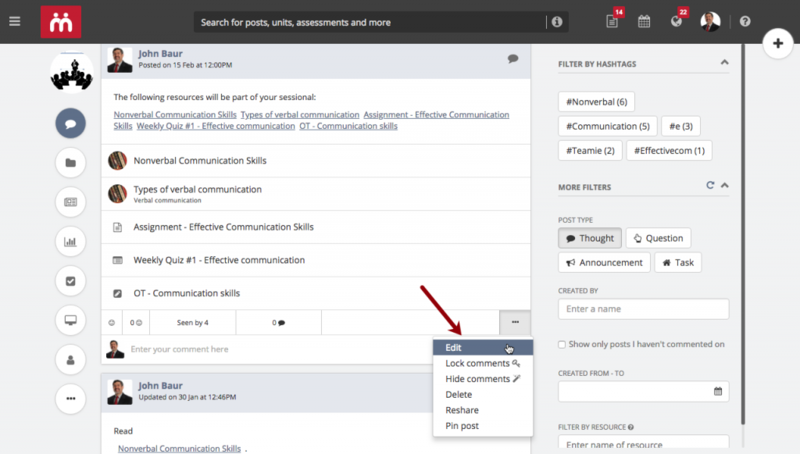 Well, you can now make those changes and edit an existing post type to convert it to any other post type. 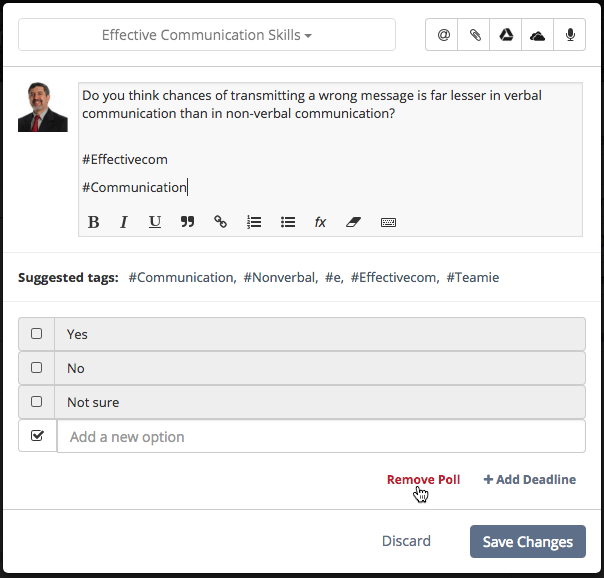 You can edit an existing thought post to make it a question post with a poll, add deadline to make it a task post or add both poll and deadline to the thought post. Once a post is converted to another type, it will attain all its functionality. 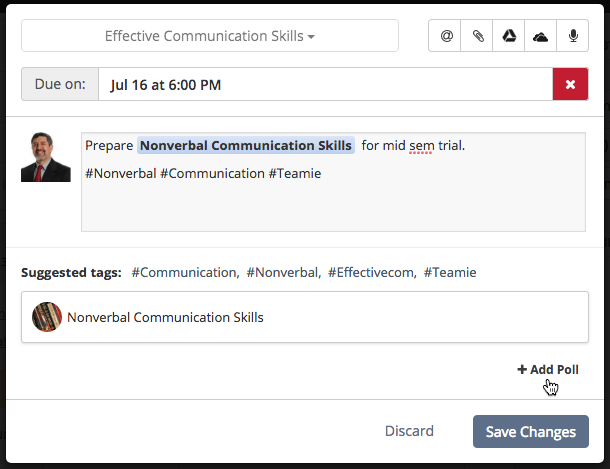 For instance, if a thought post is converted to a task post, then it will be included in learners’ To-Dos and learners will also be able to mark it as done. You can add poll to a thought post type to make it a question post. You can also remove the poll from a question if it hasn’t been taken by any user. This will turn the question post to a thought post. Similarly, you can add a poll in a task post too (although it still will remain a task post, albeit one with a poll). As an instructor, you will now be able to remove a deadline from a task post (if no one has marked the post as done). This will change the post type from task to thought. In case the task post has a poll attached, then it will become question post. Also, from Teamie Sapphire (1.42) onwards, all the post types will have the like option. This makes the action consistent across the three post types. So, keep smiling, keep collaborating. Also, Let us know what you think about this change at support@theteamie.com or give us a shout out on Twitter. 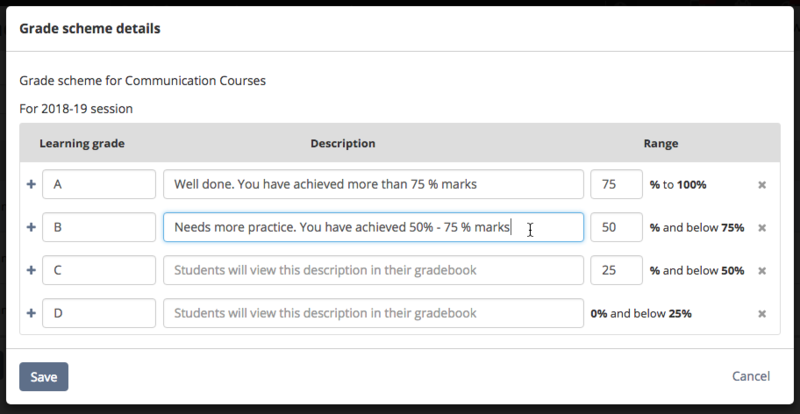 As an instructor, you can now add description while creating a new grade scheme or editing a previously created grade scheme. This will help learners get a better understanding of how they are being graded or follow any specific instructions that are provided by the instructor. 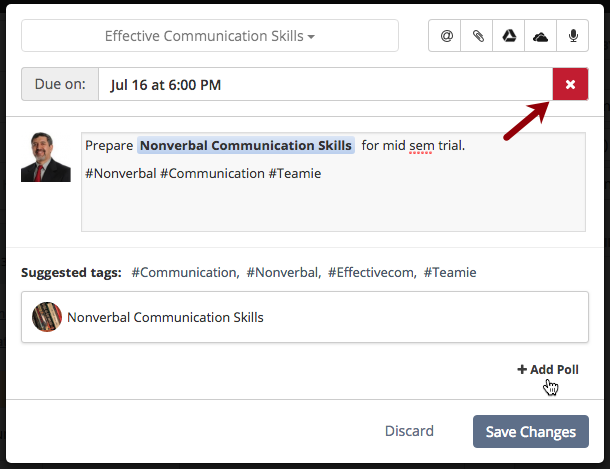 Learners will be able to view the description as a tool tip in their gradebooks, once the scores and grades have been published. 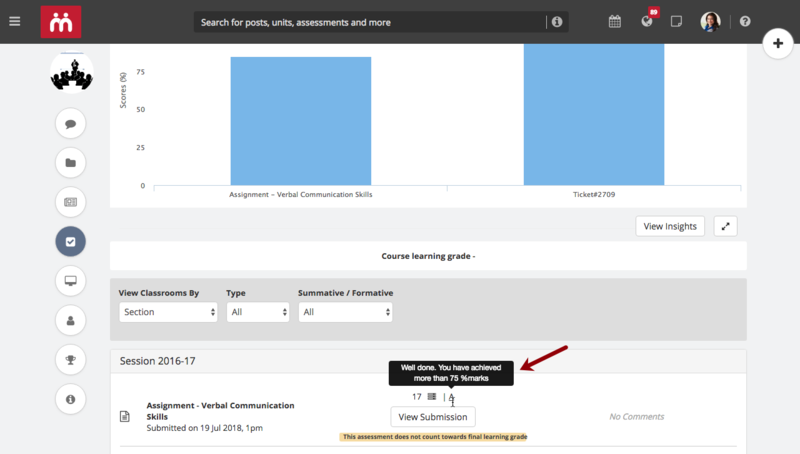 If the quiz allows the user to View Scores and Grades immediately, then the grade’s description will also be shown here. 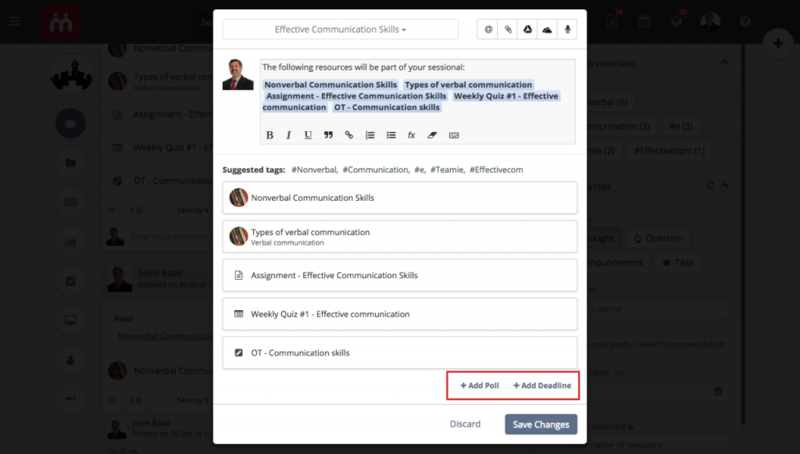 This enhancement will help instructors who export attempts for online quizzes. We have polished this workflow and the attempts export data will now include scores and responses for all attempts, as well as a much more informative summary for each of them. We hope this will help you audit and analyse the submissions in a better manner. We have updated our welcome tour that is shown to our users when they log in to the platform for the first time. This tour will show different workflows depending on the role of the user viewing the tour. In case you are an existing user, you can still watch the new tour. Just click Watch Tour from your sidebar.